Your free guide to clipping dog nails, safely and without cutting into the quick. Read on to learn how to trim your Cocker Spaniel's claws without tantrums or tears (his, not yours)! Let me explain a little about dog nails before we move on to the practical steps of how to cut and/or trim them. Of course the last thing we want to do is hurt or injure our pet, so we need to get it right first time. The inner part of the nail is called the 'quick' and it's very, very sensitive. You must take great care not to cut into it because not only will it bleed quite freely, it will also be very painful for your little boy! If you do accidentally cut into it you may inadvertently create a negative association with nail trimming, which could make it much more difficult for you the next time because he'll remember his painful experience. So how do we avoid cutting the quick? Let's take a look at your pet's claws. If they're white, or lightly colored, you should be able to see the quick quite clearly: it's inside the center of the claw, it's pinkish in color, and it tapers to a point down towards the end of the nail. (See the diagram above). However, if your Cocker Spaniel has black or dark colored dog nails, it may be more difficult to work out where the quick ends simply because it will be more difficult to see against a darker nail. Being able to see where the quick ends will make your job of trimming dog nails much easier, giving you a better chance of avoiding mishaps. No matter whether your Cocker Spaniel has light or dark dog claws, it's always best to take it slowly and only trim off small bits at a time. If your dog's claws are allowed to grow too long, the quick will move further down the nail as it grows; however the good news is that as you trim the claw back, the quick will eventually recede. What If I Accidentally Cut Into The Quick? 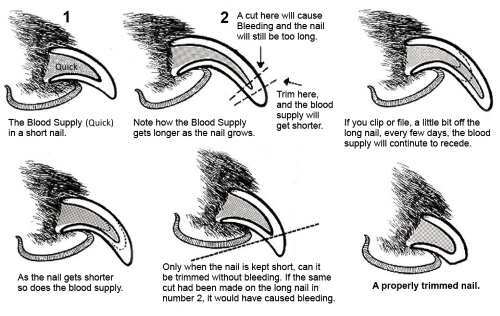 Even the most experienced groomer or vet may accidentally cut into the quick when trimming dog nails. Good to know: The origin of the word 'quick' came from the bible where it refers to 'the quick and the dead'. In this context, 'quick' means alive; the phrase refers to 'the alive and the dead'. It's very apt really as the nail is dead but the quick underneath is very much alive. So if it happens to you, don't feel too bad about it. You didn't mean to do it; it was an accident! You can easily stop the bleeding with a styptic pen, styptic powder or a little cornflour pressed onto the source of bleeding. If you don't have any of these to hand, try pressing a tissue or a clean towel onto the freshly clipped nail until the bleeding stops. If bleeding shows no signs of stopping within 8 minutes or so, you may need to take your Cocker to the vet for professional treatment, but this is rare. The good news is that the more regularly you trim your dog's nails, the further the quick will recede, making it much easier to cut each time without cutting into the quick, and also allowing you to trim the nails as far back as they need to be, ie., level with his pads. While some Spaniels don't seem to mind having their nails cut others will struggle and try to make it as difficult as possible. Like mine, for example! If your Cocker isn't used to having his nails trimmed, it may be necessary to acclimatise him not only to the feel of your hands on his paws and claws, but also to the feel of the clippers. Handle his paws as often as you can, separating and touching each claw. If he responds well, give him a small treat and praise him. When you're ready to introduce him to the clippers, let him see the clippers and explore or sniff them if he wants to. Gently tap the clippers against his claws and at the same time offer him a treat. You should find that he doesn't react to the tapping because he's too occupied with his tasty treat. Try to keep the pedicure session relaxed and fun and don't get stressed, otherwise your Cocker will pick up on your anxiety making it more likely that he'll struggle. Some dogs can become so nervous that there's a danger they may bite, so if your pet really struggles against you, you may need to play it safe and muzzle him. Best Place For Trimming Dog Nails? You might prefer to cut your pet's nails on a table or worktop. If you do, don't forget to place a non-slip mat onto the surface to stop him from slipping and sliding (a bath mat is ideal) and if it's possible, have someone hold his head and talk to him while you work. Alternatively, you can lay him on the floor with his back to you and his legs pointing away and if he struggles, you can place your forearm gently across his neck to restrain him. If you extend his front left leg, and hold the paw firmly, this should stop him from pushing himself up into a standing position. Another position you may want to experiment with is holding him upright in your lap with his back to your body. Personally, I find it much easier to cut dog nails this way. If you're still unsure about cutting and trimming dog nails, why not take your Cocker to a grooming parlour for his first trim? That way, you'll be able to watch exactly how it should be done. Tip: Not all the dog nails will be the same. Some may need more clipping than others which means you may be able to cut off more before reaching the quick, so judge each nail separately. Ask them to show you how, step by step, so that the next time your dog's nails need trimming you will have the confidence to trim them yourself. Also, there may be a time when your pet needs to be sedated at the vets, in which case that's a good time to ask your vet to clip his nails for you. Before you get down to any snipping, I strongly urge you read the user guide that came with the clippers so that you understand how to hold them correctly and how to position them at the correct angle for cutting so that you don't damage the nail or cut into the quick. Examine your pet's nails carefully to help identify where the quick ends. This will allow you to work out how much needs to be trimmed from the nail. Use the quick as a reference point for cutting dog nails and cut at least 2 mm away from the end of the quick; don't cut any further in than that. Once you have a firm grip on his paw, steady the cutting tool in place and cut firmly and smoothly. The end of the dog nail should clip neatly off, with no tearing or splitting. If you're not too confident about where to cut, or his nails are very dark, only take off a small snip at a time. Examine the cross-section of the nail after each cut; if it's dry and powdery, it means you are still cutting dead nail. As you snip, you will begin to see a dark grey/black circle or oval in the centre of the newly clipped nail; this is the beginning of the quick and you should stop cutting now. Do not cut off any more of your dog's nail. Gently file each dog nail until there are no ragged or sharp edges. When you've finished, praise your Spaniel, give him a treat and let him have some playtime with his favourite toy for being such a good boy! If you're the sort of person who prefers to see things in pictures, (like me!) this vet website has some great shots that allow you to see exactly what you should be doing. How Often Should I Trim My Dog's Nails? It's best to check and trim your dog's nails every 3 weeks or so, but depending on where you exercise your Cocker Spaniel you may need to adjust this to every 6 weeks. For example, if you walk your dog mostly on pavement it shouldn't be necessary to cut his claws too often because the friction of the concrete will help to wear them down naturally. But if his normal walks are in the countryside, on the beach, or in the park, your dog's claws may need to be trimmed more often. Generally, dog nails shouldn't touch the ground when the paws are flat on the floor, so if they grow beyond the pads of your Cocker Spaniel's feet, or you can hear them click on a tiled floor or on the pavement, it's probably time to trim them! Many dog owners shy away from cutting their pet's nails, either because they don't know how to, or they're afraid of the 'drama'. However, there are many good reasons for incorporating a quick check (pardon the pun!) and trim into your Cocker's normal grooming routine. Long or badly cut dog nails can scratch human skin, particularly children's delicate skin. Long or ragged claws can also be a danger to themselves as your pet could easily injure himself while scratching, leading to infection. Long nails are at risk of breaking off which can cause injury, bleeding, and infection. Untrimmed nails can damage polished wooden floors, carpets and furniture. They can also make walking quite difficult and if left for long enough could lead to permanent skeletal damage. Clipping Dog Nails: What Tools Will I Need? 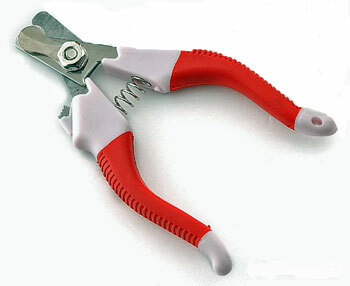 Nail clippers: there are two types of nail clippers available; the guillotine type and the scissor type. Don't be tempted to use your own because they simply won't be up to the job! You can buy the proper equipment from pet stores at a reasonable price. I prefer using the guillotine type as I feel it's easier to use, although it's a personal choice. The scissor type can be best used on dew claws where they have grown so long that they've curled and the guillotine can't easily get to the curled nail, but whichever type you decide to use you must ensure that they're kept sharp to maintain a clean cut. 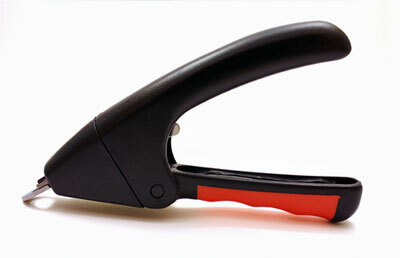 A nail file: you may want to use a small file after cutting your dog nails, to smooth away any rough edges. If you choose to use a file you can use a normal 'human' nail file or you can buy one suitable for dogs from your local pet store. Styptic pen or powder: the styptic pen (or styptic powder) may be used where you've accidentally cut into the quick and your pet is bleeding and will usually stop the bleeding in a few seconds. A muzzle: if your Cocker is particularly grumpy, (and let's face it, it's not entirely unheard of!) you may also need a muzzle. There are several kinds available and if used properly, they won't cause him any harm. I have a muzzle for Max which is a strong nylon snoot that slides over his nose and fastens behind his neck. It's adjustable for comfort and has a small opening at the mouth which allows him to pant and breathe freely. a traumatic experience - either for you or your dog!" Train Your Dog To Enjoy Having His Nails Cut! In this great video Dr Sophia Yin and her assistant show you how to 'train' a bit of a scaredy-cat into really enjoying his claws trimmed. It's truly brilliant! While we're on the subject of dog nails, I thought I'd mention dew claws. Your Cocker Spaniel will have two dew claws which can be found behind each front leg and slightly above the paw. Very often these claws get snagged on brambles and shrubs when they're rummaging about in the undergrowth and are easily damaged or ripped off. A torn dew claw can be very painful and can cause bleeding and can lead to infection. If your Cocker frequently has problems with his dew claws being snagged, the vet may recommend they be surgically removed. Dew claws don't normally make contact with the ground when the animal is standing, although they may do so when they're running, and it's because they don't come into contact with the ground that they don't wear down (like normal claws). So if your pet still has them, they'll need to be trimmed periodically. However, there's a good chance that your dog's dew claws have already been removed because nowadays many Cocker Spaniel breeders have them snipped off shortly after the puppies are born. If your Spaniel still has his and you'd like to learn more about them just follow this link.